This article is about the Nintendo Entertainment System game. 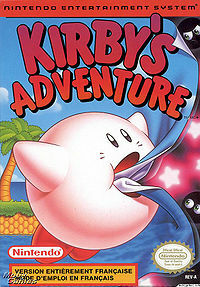 For information about the Wii game known as Kirby's Adventure Wii in some regions, see Kirby's Return to Dream Land. This article is a short summary of Kirby's Adventure. Kirby: Nightmare in Dream Land is a Nintendo Entertainment System game released in 1993 and the second installment of the Kirby series. It is notable for establishing Kirby's ability to copy his enemies' powers, which went on to become a staple of most later Kirby games. In 2002, the game was remade for the Game Boy Advance as Kirby: Nightmare in Dream Land. "Kirby's Back in Power-Puffing Action! Kirby's appetite for adventure is big as ever as he eats his way through a feast of all new enemies! In this adventure, he can also steal the abilities of the bad guys he scarfs down! With this new power, Kirby can perform 20 new tricks that will help him make his way through the nightmare infested Dream Land! Kirby's Adventure features brand new worlds to explore with the same fun, action packed feel that made Kirby's Dream Land™ for Game Boy® a hit!"